INTRODUCTION: Small bowel resection is often required during laparoscopic Roux-en-Y gastric bypass (LRYGB), either with a circular stapled anastomosis technique or resection of excess Roux overhang. An extraction bag is often used to remove the resected portion of bowel. However, an extraction bag may cause the specimen to “mushroom,” necessitating a larger fascial defect, thus increasing the risk of hernia. 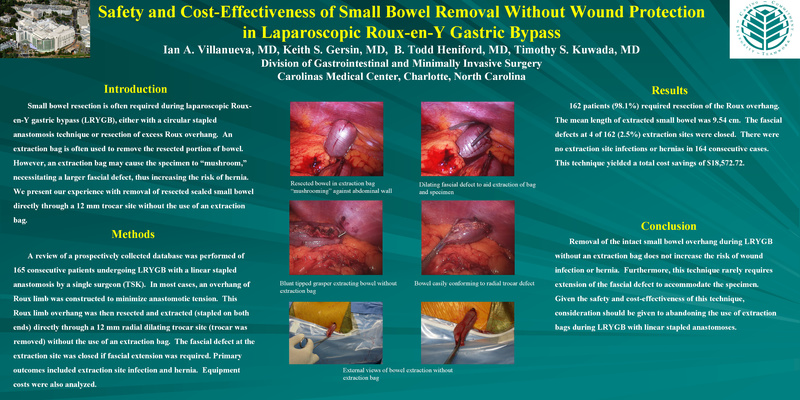 We present our experience with removal of the resected small bowel directly through a 12 mm trocar site without the use of an extraction bag. METHODS: A review of a prospectively collected database was performed of 165 consecutive patients undergoing LRYGB with a linear stapled anastomosis by a single surgeon (TSK). In most cases, an overhang of Roux limb was constructed to minimize anastomotic tension. This Roux limb overhang was then resected and extracted directly through a 12 mm trocar site (trocar was removed) without the use of an extraction bag. The fascial defect at the extraction site was closed if fascial extension was required. Primary outcomes included extraction site infection and hernia. Equipment costs were also analyzed. RESULTS: 162 patients (98.1%) required resection of the Roux overhang. The mean length of extracted small bowel was 9.54 cm. The fascial defects at 4 of 162 (2.5%) extraction sites were closed. There were no extraction site infections or hernias in 164 consecutive cases. This technique yielded a total cost savings of $18,572.72. CONCLUSION: Removal of small bowel during LRYGB without an extraction bag does not increase the risk of wound infection or hernia. Furthermore, this technique rarely requires extension of the fascial defect to accommodate the specimen. Given the safety and cost effectiveness of this technique, consideration should be given to abandoning the use of extraction bags during LRYGB.